There is nothing wrong with the idea of homeowners' associations and the general idea of common property ownership, but it comes in the moment with a price tag that is not worth the possible advantages these communities can offer. Buying a home in a mandated homeowners' association means first and foremost, you're losing many of your constitutional rights -- all of us consider just normal in this country. But I can assure you that your property rights were better protected in East Germany under Communist regime than in some of USA's homeowners' associations. You are losing your homestead-protection against foreclosure -- Meaning that you can lose your HOME to foreclosure, if some of your neighbors just feel like it. There are no safeguards, nobody to protect you -- you're all on your own. I'm not talking deadbeats. I'm talking honest families falling on hard times -- health problems or being laid off work. According to the United States Constitution, levying fines against citizens is supposedly the job of our government. But when in 2004 the Florida legislature decided to take away the right of associations to lien and foreclose for fines, the big screaming started. Admittedly, mainly screams came from the attorneys, who were upset about their loss of income -- lots of money for very little work! And last not least: As a member of a mandatory association, you're handing your wallet to some board members whose credentials may be fine -- or not -- but who very often lack the knowledge and ability to run a corporation of that size. Never forget: You as the owner will pay for the mistakes made by board, management company and attorney. And, as we have seen in some cases, it can cost you a bundle! The advantage you have according to the proponents of homeowners' associations? It will give you amenities you may not be able to afford otherwise -- like a community pool, a club house, playground for kids and similar perks developers offer in their fancy brochures. But never forget, these nice common properties can quickly turn into expensive liabilities. Not to forget “double taxation”: Normally, streetlights, road repair and cleaning your easements are done by your city or county, paid for by your property tax. As a member of an association, NOW your association dues pay for all these things -- and the county can use your property tax payments for different things. For example, if your association has private roads and road repair is necessary -- and no reserves available -- it can quickly turn into a not-so-nice special assessment -- out of your wallet! And protecting your property values? That's a attention-grabber invented by the special interests that earn their money by servicing these associations. Every honest realtor will tell you that the property values of your home depend mainly on “location, location, location” -- and upkeep! And many of the scares used by association proponents to convince you what good an association can do are already covered by county code and can be resolved by calling the county -- without cost or outrageous legal fees. Grass too high, car on blocks and a violet house with green polka dots is already barred by county regulation. And honestly, I rather have a neighbor who loves a house with polka dots than a neighbor who is part of the condo commando trying to fine me for some kind of violation because my wife brought the wrong pie to the last pot-luck dinner! I bought property far away from any association. I built our home according to our ideas, without fighting an architectural review committee, with all the little toys I think are necessary in Florida. 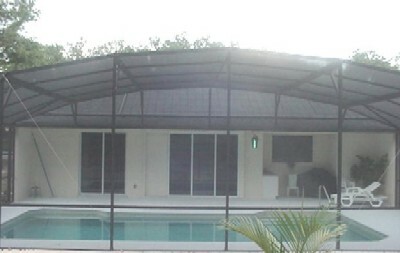 We have solar panels for my pool, supplying the necessary electricity to heat my pool during the cool season. And honestly, after seeing the solar panels installed, I was really wondering what the big problem is -- and why there have been lawsuits about the installation of solar panels? You really have to look twice in order to see them. Gee, where are the solar panels? They are on the roof, but can barely be seen. Cause for a lawsuit? And since our electrical power supply here in Florida -- a state known for its hurricanes and power outages -- is in my opinion absolutely sub-standard for a country that can send astronauts to the moon, I added a nice automatic generator for emergencies. No argument from county or neighbors. I get quite a few European visitors -- and they all remark about the antiquated system of "overland-power-lines" -- a system long ago discarded in Europe, where they only know hurricanes from watching TV pictures from Florida. Nice box will be hidden with a hedge. Generator is barely more noisy than a car, but very helpful in case of an emergency and power outage. I haven't planted some pink flamingos in my front yard yet, even if I don't have to fear to find any violation letter in my mailbox threatening a fine for having a lawn ornament without approval. Actually, if I would set them in our front yard, I would have to fear a different committee -- my beloved wife -- who would definitely complain about these pink flamingos! And as a bonus: Within two days after moving in all our neighbors visited and welcomed us to the neighborhood -- without commenting on solar panels, generator -- or all our Crape Myrtle in the front yard being too red! Believe me, it feels really good to be an independent homeowner again. But the experience in my association definitely taught me to enjoy the newly-won freedom even more! We need education, accountability and enforcement. Filling pages with statutes that can only be enforced by people with lots of money to waste on lawsuits is definitely not something our society should stand for! And even if I don't have to deal directly with the abuses of associations any longer, I have seen and heard too many horror stories in order to stop what I have been trying to do for the last 8 years: Push for legislative reforms to make associations again what they were supposed to be when originally created -- A nice place to come home to for the whole family, with nice amenities cared for by the association.